Looking for the v10 manual? Visit our new user's guide! 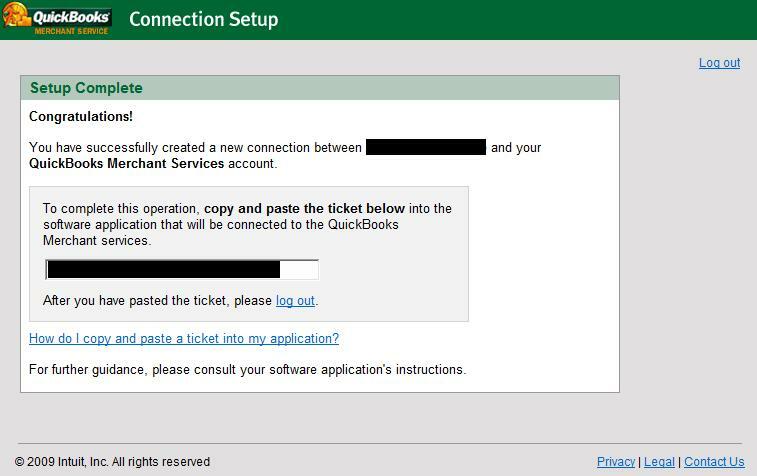 The storefront software needs 3 pieces of account information from Intuit/Quickbooks to connect to the QBMS gateway (see below). The steps to obtain that information are as shown below. Please be aware - the Intuit/QBMS registration process is long and complex, and changes frequently without notice. While AspDotNetStorefront attempts to stay up to date with their procedures so that we can be as helpful as possible, providing store admins with the ApplicationID and Connection Ticket is ultimately Intuit's responsibility. 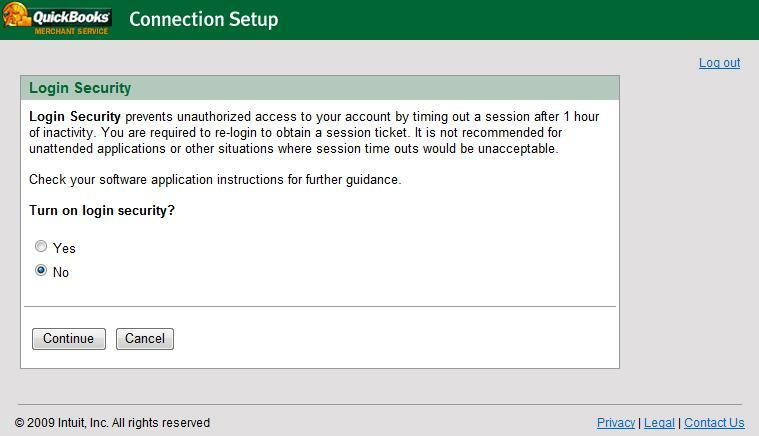 If any problems are encountered with the first section of the directions below, please contact Intuit's gateway support. 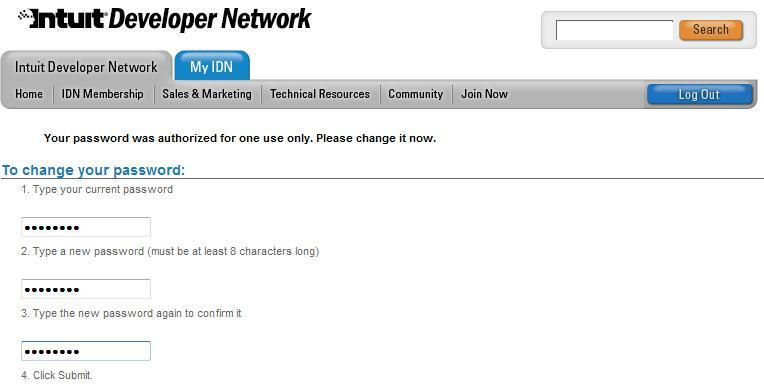 NOTE: Intuit's pages support Internet Explorer only. Customers using other browsers will be told to switch to IE and won't be allowed to continue. 1 - Visit http://appreg.intuit.com/ and click the 'Join Now' link. 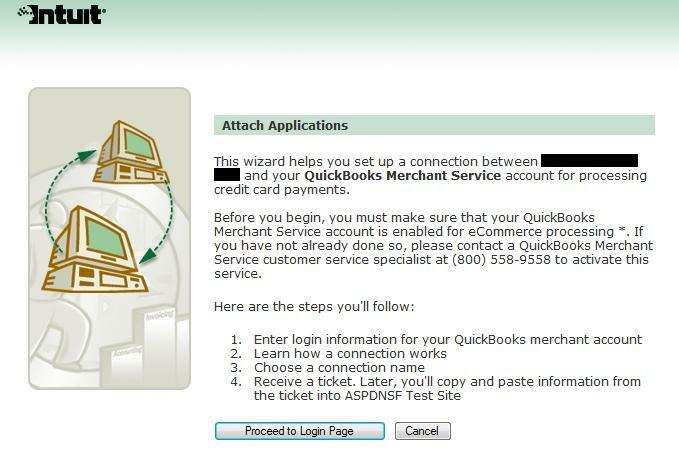 2 - Enter the personal information requested, then select the "QuickBooks Merchant Services" checkbox. 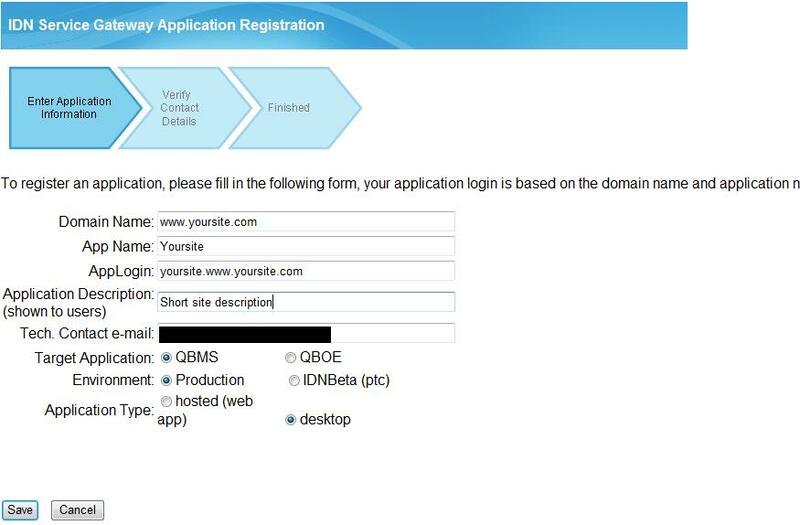 If you will be the only person working on the QBMS account, click 'Individual Registration'. If multiple people will be registering applications and creating connection tickets (this should almost never be the case), click 'Company Registration'. 3 - Fill in the address information and click 'Next'. 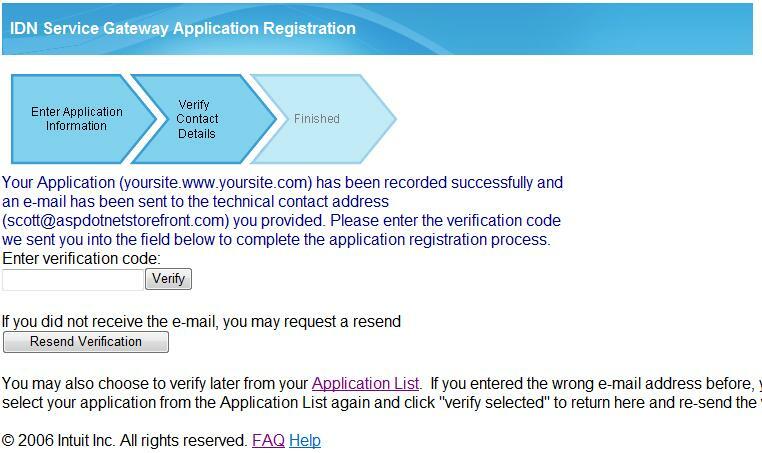 4 - You will be shown a screen indicating that registration was successful. 5 - You will be sent an email with a temporary password and a link to click to log in. Click the link, and you'll be able to set a new password. 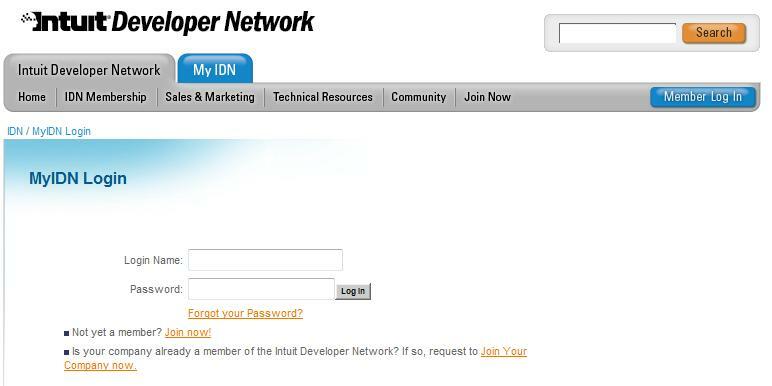 6 - Navigate back to http://appreg.intuit.com/ and log in with the account created in steps 2-5. The screen below will appear. Click 'Add'. 7 - Populate the fields displayed and click Save. - Tech Contact Email - Where Intuit will send tech-related (password changes, API info, etc) information regarding this account. Can be different than the account used to register. - Target Application - This must be set to QBMS. - Environment - If this is for your live site, choose 'Production'. If you are generating an AppID and Connection Ticket for testing, choose 'IDNBeta'. - Application Type - This must be set to 'desktop'. 8 - You will be emailed a verification code to enter to complete the process. Copy/paste the code into this field and click Verify. You will be taken to the final registration page. 9 - Navigate back to http://appreg.intuit.com/ and your AppID and AppLogin will be displayed. Copy these down. 10 - Navigate to https://login.quickbooks.com/j/qbn/sdkapp/confirm?appid=&serviceid=1002 replacing with the AppID obtained in step 9. You will see the page below. Click 'Proceed to Login Page'. 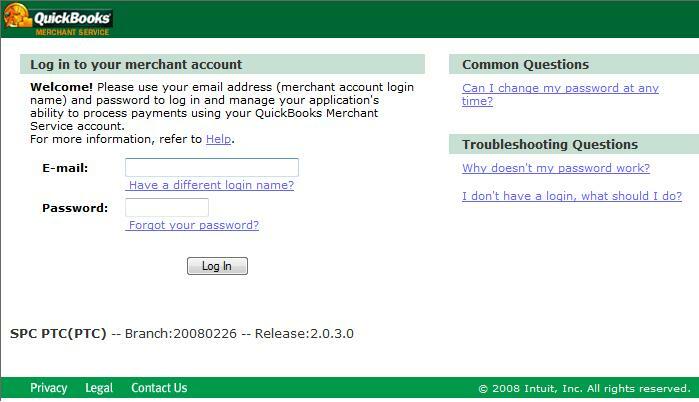 11 - Login with the merchant account information you created with Intuit. For a test account, visit THIS LINK to signup for an account, and then visit THIS LINK for test instructions, and THIS LINK for additional testing procedures and test credit card information. 12 - Leave the radio button defaulted to 'No'. Setting this feature to 'Yes' will prevent the storefront software from connecting to your QBMS account. 13 - You will be shown your Connection Ticket, specific to the AppID created above. Copy this down as it will be needed later. 2. In the Config Search box, enter “QBMERCHANTSERVICES”, then click Search. 3. The following AppConfigs will need to be populated with your personal account information, obtained in the steps above. Do not change the other AppConfigs unless instructed to do so! 4. Finally, go to the Config Wizard page in the AspDotNetStorefront admin site and select “Quick Books Merchant Services” from the Payment Gateways section. Click the “Submit” button, and your gateway setup is complete. Copyright ©1995-2017. All Rights Reserved. Powered by the AspDotNetStorefront Shopping Cart Software, (ML v9.3.1.1/asp.net 3.5). Patent Pending. All logos and brands trademarks of respective companies shown.